The ultimate concept in protection technology. 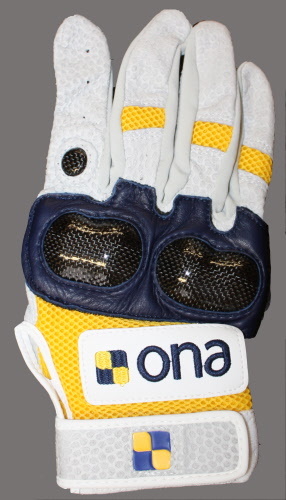 The Ona Polo Carbon Pro Glove offers a unique shield system through anatomically designed carbon fibre inserts covering the knuckle area and index finger. The exceptional properties of carbon fibre: high impact resistance and strength, provide superior protection against blows to the hand during play. The anatomically designed inserts and easy fit interior padding add comfort and provide total freedom of movement enabling a correct hand position. Ona Polo innovative "inverse closure mechanism" maximizes grip control. Performance Air Mesh across knuckles and back of hand provides added impact protection. Reinforced thumb and index finger protect key stress area. A wide wrist strap offers extra support with an extended Velcro® closure for adjustment. Air flow cool fine mesh inserts enhance breath-ability and fit. Pittards® unique surface Atomic texture leather optimizes grip on contact surface for mallet control. WR100X water resistant technology, delivers superior wicking of moisture (perspiration) and humidity (environmental effects) for optimum efficiency and comfort. The WR100X treatment also enables the leather to breathe thus retaining its softness, suppleness and feel.